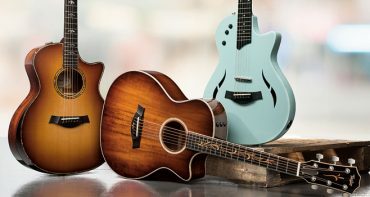 If you’ve spent any time in the world of acoustic guitars, you’ve probably heard the terms “comfort” and “playability” thrown around like guitar picks after a show. For novices, these descriptions might seem a little vague. Let’s take a minute to clear things up. 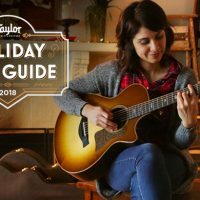 What Makes a Guitar “Comfortable”? When we talk about comfort, generally we’re describing the physical experience of holding and playing a guitar. This begins with the actual size and shape of the guitar, which can affect every other aspect of playing the instrument. 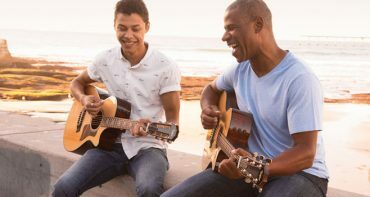 A guitar that’s too big for the player can make it hard to get your arm comfortably over the body to play the strings (especially if you play sitting down), leading to fatigue and frustration. You should be able to reach the strings without causing soreness in your arm or shoulder. Fortunately, there are plenty of options out there to mitigate this problem. 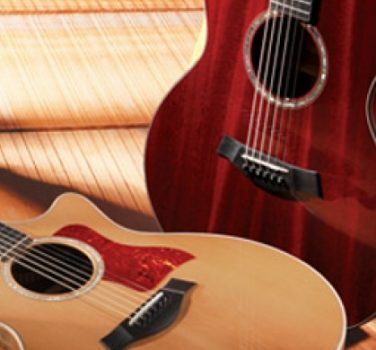 Back in the ’70s, big-bodied guitars like the wide-waisted dreadnought and the curvy jumbo were common. Nowadays, it’s easier than ever to find guitars with different body dimensions to physically fit your stature. 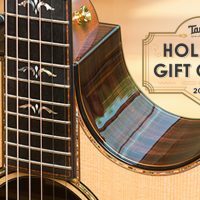 In the mid-’80s, Taylor developed the smaller-body Grand Concert, a lap-friendly guitar that appealed to many fingerstyle players. A decade later, we introduced the Grand Auditorium, featuring a medium-size body that was larger than the Grand Concert but smaller and less boxy than a traditional dreadnought—featuring a more tapered waist than the dread, which allowed it to fit more comfortably in a player’s lap when seated. The Grand Auditorium went on to become our most popular shape. 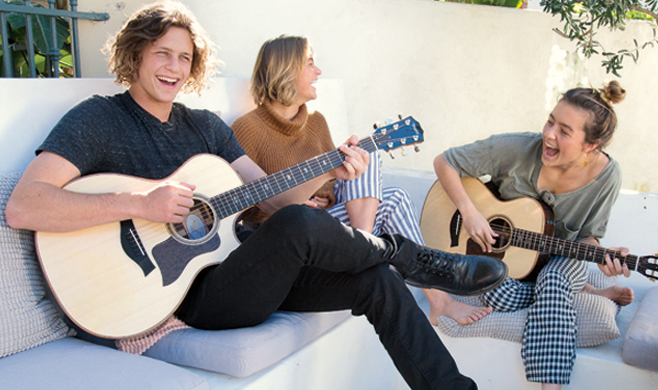 Not only is it comfortable for people of all sizes, but its dimensions also make it a versatile instrument that can handle a variety of playing styles and musical situations. Playability refers to how the guitar’s neck feels in your fretting hand when you play, and how easy it is to fret and pluck the strings. This can be influenced by a variety of factors, including the profile of the neck, the “action” (how high above the fretboard the strings are), the gauge of the strings, the scale length, and the neck angle, among other things. Let’s touch on a couple of these points. 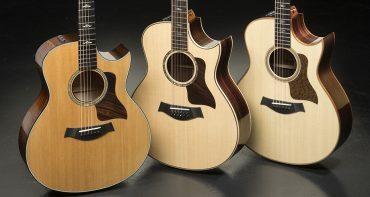 A guitar’s neck profile varies from brand to brand. 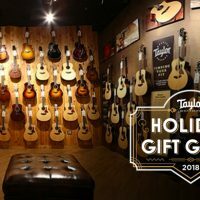 Taylor’s neck profile is slimmer than many other guitar brands. This makes it easier to wrap your hand around it to fret notes and form chords. 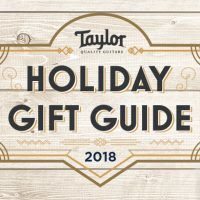 Another distinctive trait of a Taylor neck is comfortably low action, which means players don’t have to apply a lot of pressure to the strings since the strings are fairly close to the fretboard. 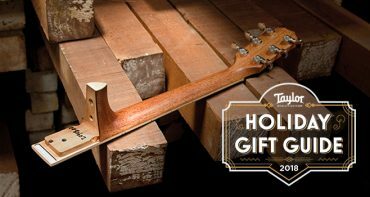 Between the profile and the action, Taylor necks are considered very playable, and less stress on your fretting hand means you’ll be less susceptible to physical fatigue. Playability is especially important for beginning players—it creates a more inviting and forgiving playing experience. It’s also important to think about how a guitar is set up. Without getting too technical, this relates to the alignment between the neck and the body, or the neck angle. 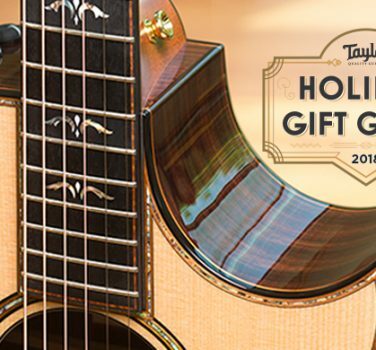 Taylor necks feature a patented design that allows us to precisely calibrate the neck angle for an optimized setup. 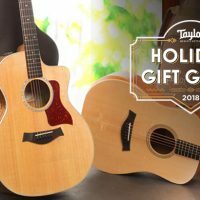 What’s more, the design allows the neck angle to be easily micro-adjusted throughout the course of a guitar’s life by a Taylor-authorized service technician if the guitar ever needs it. This enables that playability to be maintained as long as you own the guitar. 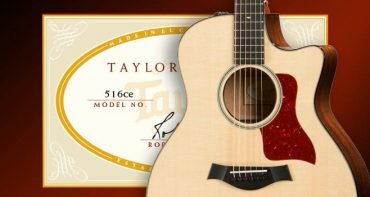 A service technician can also further customize a guitar’s setup for your particular playing preferences. Ultimately, “comfort” and “playability” are intertwined. 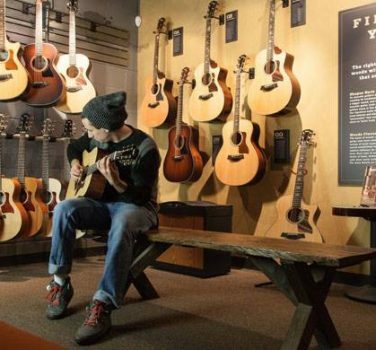 The next time you sample and compare guitars in a music store, pay attention to the physical feel of the body and the neck. A guitar that’s comfortable to play will make the experience that much more enjoyable.